What am I referring to? Audiobooks and Podcasts, of course. I commute and have done so for over 19 years now. 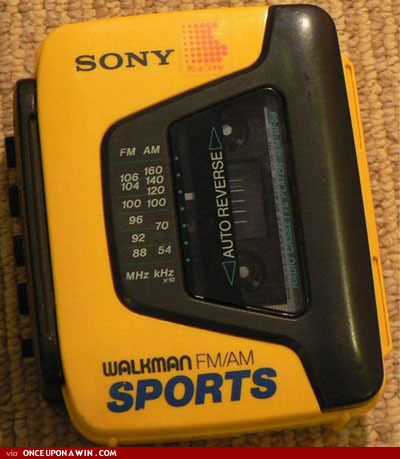 Either I was going to school or going to work but the one gadget that I always took with me was my yellow Sony Walkman, then silver Sony Discman (darn it, cannot find an image of the one I had) and finally my iPod (I’ve owned 4 now). I really wasn’t a book reader in those days. Plus reading on the bus made me nauseous and still does. Throughout decades of this earbud addiction (i.e., the better part of my teen and adult years), I have noticed a significant shift in the type of things I listen to. The ’80s and ’90s were no doubt my most musically intense times. That makes sense because that’s where I was developing my ‘ear’ let just say. Something happened in the last 5 years though. My music sensibilities changed drastically and my taste for what came out of my ear buds was also altered. I started downloading these things called Podcasts when I got my first iPod. They were informative, interesting and totally addictive. I remember that I worked for a company that used Mac’s and since I was a total novice with anything to do with Apple, I decided that learning about Mac through Podcasts would be a perfect match. Fastforward 5 years ahead, I owe a lot of my social media/web and technology knowledge to Podcasts of all sorts. Oh yes, even foodie podcasts. I love the idea that as I am walking, shopping and staring out into space (but not really) … I am totally absorbed by what is being pumped direcly into my brain and I hope … learning something. Audiobooks are another way I spend communte time. You name… it from Agatha Christie to Sophie Kinsella to Seth Godin, I am there and I am present & accounted for. What’s that? What did Seth mean? Well, let back that up 30 seconds (new feature on the iPod – Yippy) and listen again until I understand it. I get my audiobooks from Audible and have done so for about 2 years now. I’m trying to keep my brain working and this is the best way for me. P.S. I’m even learning about Art History on Audible. HA!